It’s been a full and happy month away from this little corner of the internet. It began with a beautiful wedding in the hills of Montecito, the Pacific stretched out below our feet, followed by a little visit to paradise. Ah, Hawaii! We visited Pearl Harbor, hiked Diamond Head and swam with the fishes in Hanauma Bay. But the highlight of the trip was on the Big Island, which we can now confidently confirm (after our second visit) is our favorite little place on earth. It wasn’t the steep climb down the winding trail to the floor of the Pololu Valley, its green cliffs receding above us as we inched closer and closer to the black sand beach. It wasn’t the climb over lava rock and through thorny brush to a secluded cove filled with sea turtles, basking on the shore and swimming just beyond our reach as we waded into the warm turquoise water. The highlight wasn’t a view or a hike or a meal, but a person. A man in his 60s with white hair and blue eyes, full of energy and peace, who planted a forest. In the early 1980s he bought an old cattle ranch high in the hills over Kailua-Kona and scattered the grass with Ohi’a and Blue Marble trees, ginger plants, heliconia, and coffee. In among the foliage, he tucked buddhas and prayer gates, quiet stone benches, where we were encouraged to stop and listen to the parrots and song birds flying overhead. We wandered through this magical cloud forest with a cat following close behind, while our new friend welcomed us into his own little corner of the world. Back in the car after our visit, Matt and I were happily grinning, still spellbound by this lovely man and his beautiful forest. Returning home was like traveling back in time to an earlier season. I immediately changed into jeans and a sweater and enjoyed the refreshingly cool spring air. 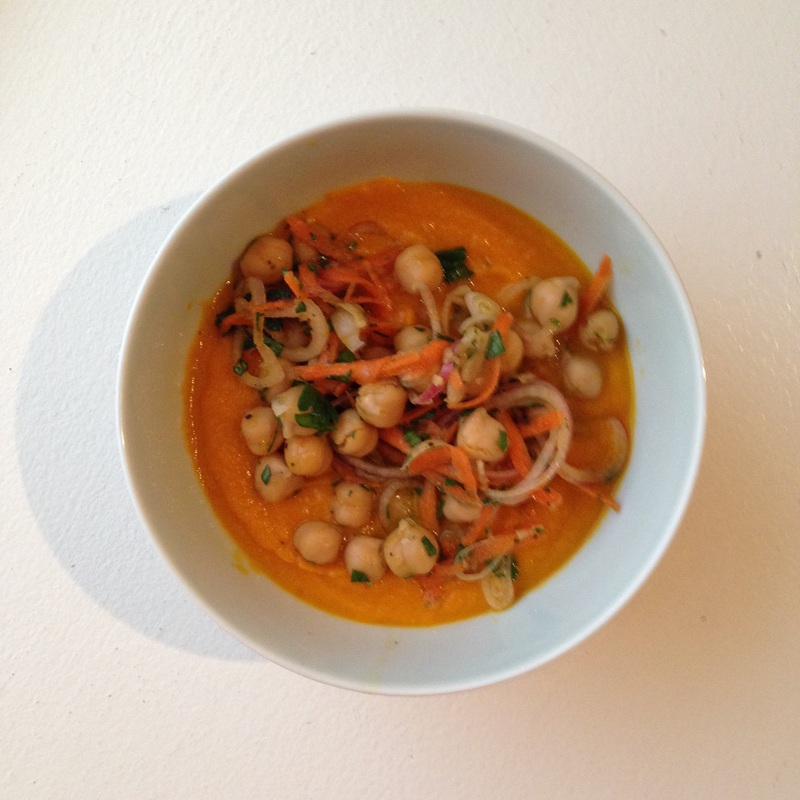 For our welcome home meal, I cooked the springiest spring food I could muster – a carrot and leek soup, topped with a warm chickpea salad. It looked like sunshine in a bowl and tasted like the first harvest from a backyard garden. Sadly, this will likely be the last spring meal you’ll hear about from me for a while. That fleeting season lasted for all of a day or two before summer set in on D.C. It’s hot and humid now, and buzzing with that carefree freedom that warm days seem to bring. Like we brought a little bit of Hawaiian happiness home with us. 1. In a pressure cooker over medium heat, melt 1 tablespoon of the butter with the oil. Add the leeks and saute until translucent, about 2 minutes. 2. Add 1 quart of water, the carrots, sprig of tarragon, and 1 teaspoon of salt. Secure the lid, and bring to full pressure over high heat. Cook the carrots for 7 minutes. Transfer the pot to the sink and run cold water over it to release the pressure. 3. Discard the sprig of tarragon. Add the orange juice, maple syrup, and remaining tablespoon of butter. Using an immersion blender puree the soup (or transfer in batches to a standard blender or watertight food processor). Season with salt and pepper. Tags: lunch, soup, spring, vegan, vegetarian | Permalink.